Nobu Matsuhisa and Robert De Niro are excited to announce the opening of their New Nobu Hotel in Marbella on March 29th. Unlike any other hospitality offering in Spain’s most famous year-round resort community, the adults-only hotel with 81 guest suites, will offer a vibrant mix of contemporary design, gastronomy and good times. It is the third property in Europe and a Small Leading Hotel of the World focusing on Food,Drink and Lifestyle. There will be a sunset DJ sessions with a roving mixology cart. 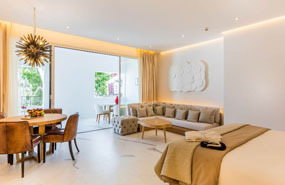 The neighbouring Hotel Puente Romano and part of the same hotel group, lets guest enjoy their nightclub and Michelin star restaurant Dani Garcia plus the relaxing Six Sense Spa. Guests have access to the Dave Thomas designed Golf Course and an equestrian centre.